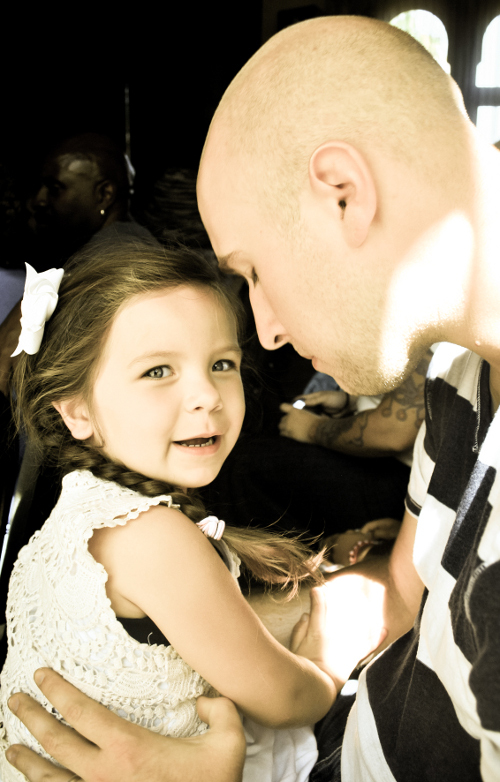 I took this photo of Punkin and Hubby a couple of weeks ago at church. We were there to celebrate a great accomplishment of one of my cousins - a program through the church that he had completed. We were there to celebrate other people as well. People who God had called and people who were reveling in excitement to share their story of what He had done for them...and how He will continue to fulfill their needs and the needs of others through their stories. I love this photo. I like looking at it. There is something about it that brings me peace. Something that in this time of chaos, I need. Not just in my life, but in the world around us. Most of the crazy that I have going on is a good kind of crazy. The kind where you are kept super busy and even though you are completely exhausted, you are excited because you have so much to look forward to. You are excited because...you are actually taking steps forward. Yet, every day I am filled with heartache with what is going on in the world around us. So much violence and hate. I can't go anywhere without seeing or hearing about another shooting, another robbery, another protest, another murder...another person making a spectacle because they were treated "unfair". I guess they weren't taught the lesson I was taught when I was first able to understand anything about life and the way the world worked..."life is not fair." So the only thing I can do is find the beauty that is left. Whether it's a smile or kind word from a stranger, or enjoying the beautiful flowers and all of the green that summer has brought, or looking forward to fall (my favorite season) and apple picking, or in just finding the simplest beauty that has been captured in a photo...like the one above. Makes you really think about how fast time goes by, how we are always in such a rush that we miss out on so many things that can make us happy...and how fast the world actually changes in that time. As I had predicted, I was not able to get everything finished that I needed to last week. It's okay, though. I am okay with it. I still feel a bit overwhelmed with everything that I need to get done...but I'm not "worried" about it. It's okay to take a break. To slow down and spend time with a loved one and just appreciate today and everything you have...even if it is not very much. I have learned that God is in charge and no matter how hard I fight it, He has a plan for me. He and I sometimes have a different idea of what my priorities should be. So I am going to stop fighting. I am going to let Him take the reigns. I am going to try to do my best to put my trust in Him and believe that he will not steer me wrong. After all, He has done a pretty good job so far. Hope you all are having a wonderful week and are able to find peace and beauty in the smallest of things! What a great picture! I can see why you love it so much.